I would punch a baby for a NA release now. 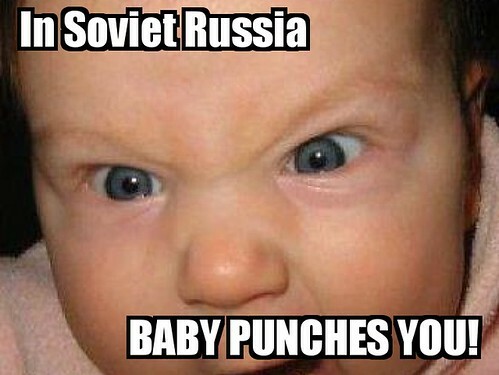 Of course I would punch a baby for alot of things.... I've decided i hate children. This is the GREAAATEST DAY OF MY LIFE!! WOOOOOOOOOOOOOOOOOOOOOOOOO!!! Great, so once it gets an NA release, I'll have the temptation to play it anywhere.. at anytime... On my PC at home... on the toilet on my phone... on my Vita on the bus.... This is an unhealthy addiction waiting to happen. The fact that the best source of information on PSO2 is generally the Phantasy Star Fan Blog, or PSFB, is one of those "funny every time" things to me (see Urban Dictionary for why). I liked the older games and have been looking forward to this one (although not enough to bother to play on the Japanese servers), but PSFB just doesn't stop being funny. I am both proud and a little ashamed to be able to say that I got a PSFB guild approved a few years back in FreeRealms, of all games, along with my friend who's a photographer for SuicideGirls (thanks to whom I heard the term in the first place). He is also coincidentally looking forward to playing PSO2 with me. Heh. Can anyone tell me how much like the original DC PSO this is? This sounds like I will need the Vita 3G so I can play this game every waking moment with 0 down time. I'm also hoping they continue the PSP (Phantasy Star Portable) branch of the series as well. I love you Sega, and when the game this side of the ocean I'll marry you. I'm really glad to hear this game has been made and I really want to play it. Funny thing is from all the game play footage I've seen it reminds me a lot of Monster Hunter or am I the only one see that. I've been waiting for a true Sequel to PSO for quite awhile now (Never really like the PSU series or PSP). I cannot wait for a western release, and if it comes out on the Vita, just gives me more of a reason to want one. Dammit, come out in England already. I was playing a lot of the PsP game recently and it was really good, brought back a lot of memories of playing PSO1 on the gamecube with my brother. Actually, players on all servers(ships) can crossplay between Vita and PC but Vita players will be restricted to Block 19-23 on each ship. This will give PC players the choice of interacting with their Vita player counterparts or not. As much as I love PSO2, I think I'll end up giving this a miss. I already play the PC version and there's no point in having an MMO on the Vita when the 3G is so poor for online gaming. Maybe it's just Wipeout that is bad and PSO will be playable over a 3G connection but my experience tells me I won't be able to play this anywhere without a wi-fi connection. And you wouldn't want to play PSO2 without a stable connection. The game is brutally punishing for any missteps, especially as a Ranger. I really wish Sony had made or will make a 4G version of the Vita available, I would pay the extra for that. Stable online play anwhere for console quality games would truly make the Vita a lot more competetive with smartphones. But alas, Sony is run by Grizzled Ancients that can't keep up with the times. Judging by everything I've seen, they have kept true to the original, while adding much better graphics, jumping, and various other improvements. No, that's going too far. Baby-punching is wrong. And bad. There should be a new, stronger word for baby-punching. Like badwrong, or badong. Yes, baby-punching is badong. From this moment, I will stand for the opposite of baby-punching: gnodab. Ahem, also, I'd like to see what this ends up looking like on iOS. I had a blast with PSO on the Dreamcast. Fond memories. Then you do not love PSO enough! I will go super villian for PSO, I will be known as "That Jerk!" and there will not be a baby unpunched until my demands for PSO2 NA release are carried out.... and I want a pony. Thanks for answering! I hope you are right, the original back in '99 was my first online gaming experience and I loved it!